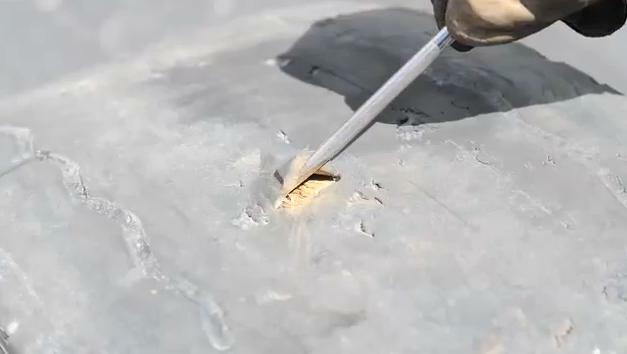 Removing tire debris with a gasket puller. Here’s a tire inspection quick tip: use a gasket (or seal & bearing) puller tool to remove debris found in the grooves of the tire. Stones or bits of metal or glass can start working their way in the tire and need to be removed before working their way down and causing greater damage. 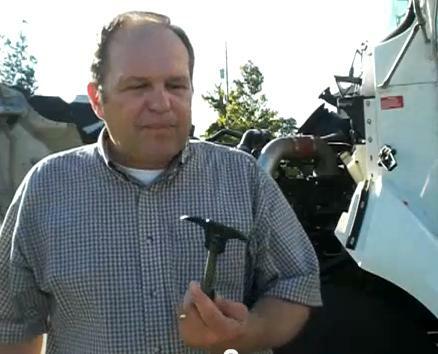 A gasket puller makes quick and easy work of tire debris removal. 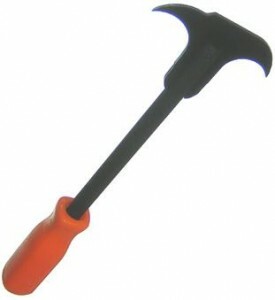 A gasket puller can be found at most automotive part stores for about $10 or less. Get the most of out your tire investment by frequent inspections and professional care. The gasket or seal puller hand tool. Use the gasket or seal puller when doing a pre-trip, en-route or post-trip inspection, while waiting at a dock or anytime after driving on areas where road debris is found. The CSA Tire Inspection video starts with the now standard boilerplate legal disclaimers, followed by a musical intro of a turquoise blue Michelin truck, and self-introductions by Kevin Rolling, of the Tire Industry Association, and Doug Jones of Michelin, NA. At 2:45 there is an introduction to CSA (DOT’s regulatory enforcement methodology) and Capt. Douglas Shackelford (North Carolina State Highway Patrol) tells us he will talk about the “visual inspection components” to avoid inspections. CSA created a new Safety Measurement System (SMS) for both driver and company. Under CSA, individual road violations are assigned a “severity rating” that ranges from one to ten, with ten being the most severe and the most likely to cause an accident. 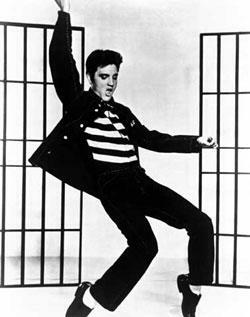 Feeling the face or crown of the tire for damage by laying hand flat on tire and sliding it across the face. These are generally cited as Out-of-Service (OOS) conditions. Exception: An under 3/8 inch bulge on the sidewall, if accompanied by a blue repair triangle (no more than two repair patches) is acceptable. Use a “bulge gage” to measure the height of the bulge, if in doubt. Lead tires (steering tires, converter dollies for semi-trailers and steer axles on full trailers ) must have at least 4/32s tread depth at any point on any major groove expect where tread wear indicators or stone ejectors are located. 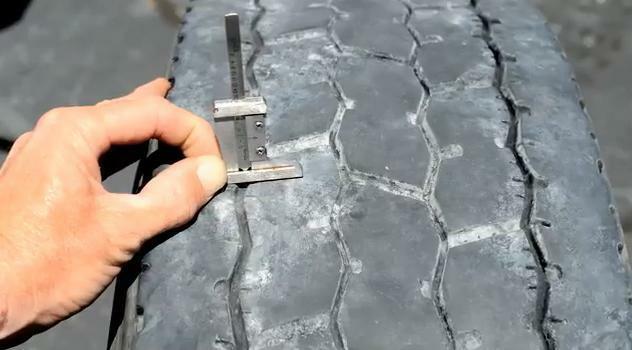 All other tires must have 2/32s inch in every major groove of the tire. 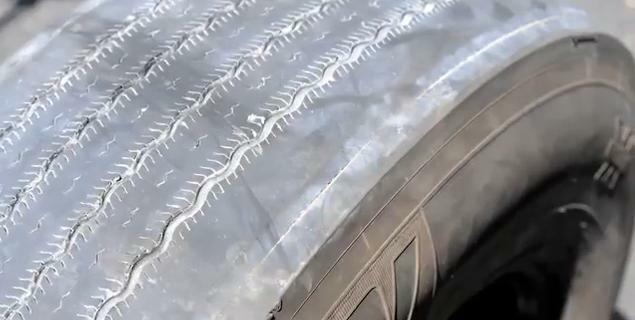 If tread depth is under the limit as established by Part 393.75, then the driver will be cited for a violation and assessed points under CSA. 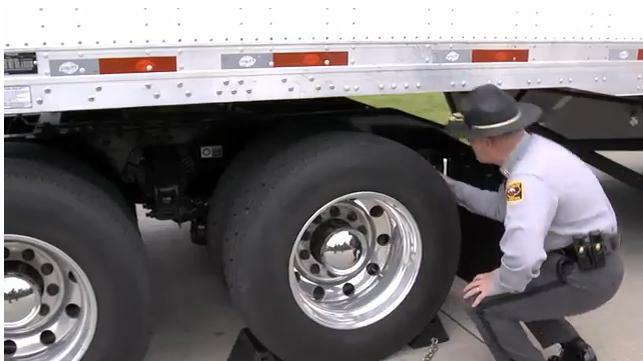 However, the vehicle will be placed out of service if the tread depth is below the limit set by the Commercial Vehicle Safety Alliance (CVSA). The vehicle is OOS, if tread depth is under specification at any two adjacent grooves. The decoupling groove at the shoulder is not a major groove. 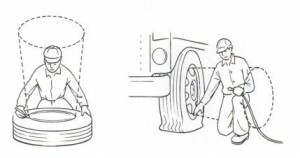 Other terms for this tire feature include: “shoulder wear protector” or “defense groove” or “pressure distribution groove,” depending on the manufacturer. If a tire is out of specification, then this is a citable violation (ticket-able) but not an out-of-service (OOS) condition. 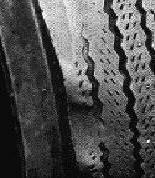 Insufficient tread in a decoupling groove is not a violation or an OOS condition, if all the major grooves have sufficient tread depth. 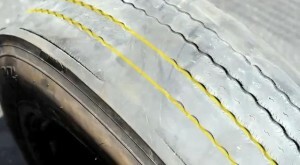 Irregular wear (example: tire “cupping” from dry steering) is not a violation or an OOS condition, if all the major grooves have sufficient tread depth. Missing tread chucks are not a violation or an OOS condition, if all the major grooves have sufficient tread depth and the missing tread material does not expose the ply materials. Weather checking is not a violation or an OOS condition, if the checking does not expose the underlying material. FMCSR 393.75(4)(d) says, “No bus shall be operated with regrooved, recapped or retreaded tires on the front wheels.” This is an OOS condition. A “regroovable” tire is allowed, but not a regrooved tire. Almost all of these conditions carry a “severity rating” of eight points if found during a roadside inspection. Example: a tire is found during a roadside inspection with less than 50% of inflation as marked on the sidewall. As such an OOS condition exists (as the tire is considered flat and may have sustained hidden “run-flat” damage). The inspections performed by a US DOT certified roadside inspector under CVSA guidelines are focused on CRITICAL items. 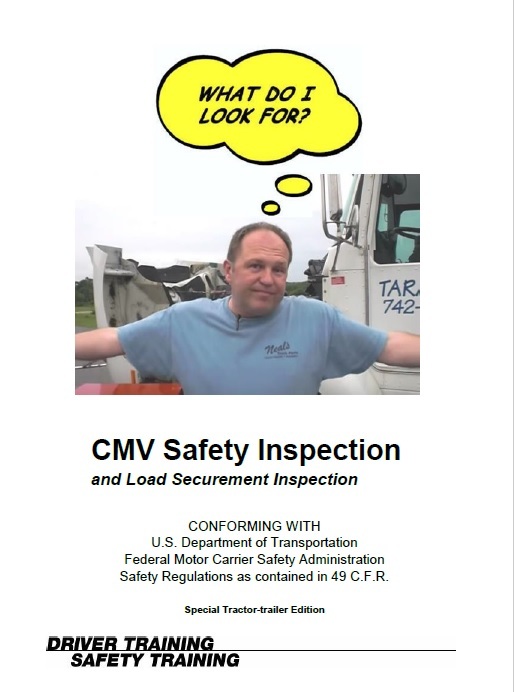 A driver has a duty to thoroughly inspect (and document) not just the aforementioned “critical items,” but all items (as specified by the regulations) on a vehicle and its load. The “window of opportunity” is the period of time when a part or accessory begins to exhibit poor performance, prior to a repair being made. This is a period of time and/or of deteriorating performance when the part or freight is in a sub-critical condition that will require service or repair. 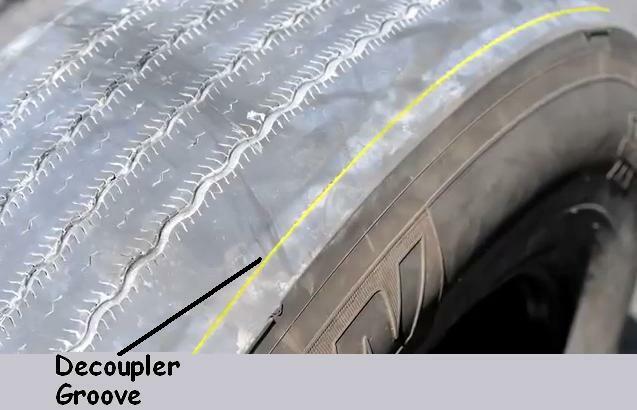 For example, when laying a hand flat on tire and sliding it across the face or crown of the tire, if one direction feels smooth and the other has sharp edges, then there is a lateral drag problem (edges of the tire are feathering away from the direction of the push), possibly due to excessive, unequal camber, resulting in decreased MPGs. Irregular wear is an indicator of future trouble. Always try to always stay out of the tire’s trajectory areas and know when use a tire cage when working around tires. Several years ago, a small child was killed in Michigan watching his father inflate a truck tire. Learning how to properly read a tire can prevent later breakdowns in critical items, saving time and money, honor and lives. Stay out of the tire's trajectory areas and know when to use a tire cage when working around tires. – cargo insurance policies will NOT cover losses due to bad load securement? – a driver can face criminal charges if someone is hurt or killed as the result of an unsecured load? When things go wrong . . .
(I) Application of the federal DOT regulations is determined on a trip-by-trip basis, based on the “intent” of the trip. Most states have adopted the federal motor carrier safety regulations. Example 1: An employee (of a contractor) offers to carry some work supplies across state lines to a work site with his personal 11,000 pound Gross Vehicle Weight Rated (GVWR) pickup. Both the vehicle and driver would be DOT regulated* on that trip. Example 2: An employee (of a contractor) uses the same, personal truck to carry his own work tools to a work site. The vehicle and driver would NOT be regulated on that trip. Example 3: A contractor uses his personal 11,000 pound Gross Vehicle Weigh Rated pickup truck to carry his own work tools across state lines to a work site. Both the vehicle and driver would be regulated* on that trip. (II) If engaged in “commerce,” DOT compliance requirements are based on the weight of the vehicle. Each “Part” of the regulations should be taken into consideration; application of the DOT regulations are determined on a “Part-by-Part” basis. Is your vehicle (power unit or trailer or combination) over 10,001 pounds Gross Vehicle Weight Rating GVWR (empty or laden – it doesn’t matter)? If yes, it is a Commercial Motor Vehicle (CMV) under 49 CFR Part 390 – (see “Definitions”) and parts 390, 391,392, 393, 395, 396, etc., apply. If the GVWR is under 26,001 pounds (or under 10,000 pounds GVWR for the trailer) it is a non-CDL vehicle then Parts 40, 382, and some of 383 would not apply. As a rule of thumb, assume “all” of the DOT regulations apply to your operation and then work backwords for any exceptions to the rule. – Delayed action is perilous. If you own or operate a truck used in business, then it is likely both the truck and driver are DOT regulated.